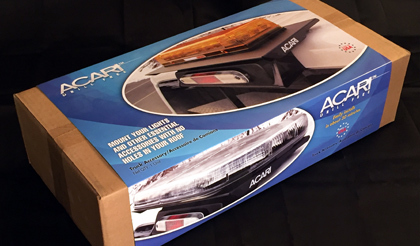 Kelly Design recently completed a website re-launch and packaging sleeve design for ACARI Products – manufacturers of mounts for warning lights, antennas, work lights and other essential accessories without drilling.The redesigned website features a customized rep and dealer locator module, while the newly designed retail sleeve design was created for distribution in Canada. The products ship in corrugated containers ranging from 24″ (shown) to 36″ in width. The sleeve wrap was designed to accommodate four different sized product cartons. They were printed, scored and delivered flat with an adhesive glue strip for adhering to the corrugated containers.